Windows Server 2008 is an awarding winning Microsoft Windows’s sever line of the popular operating system that succeeded Windows Server 2003. This system empowers IT administrator flexibly and efficiently manage and maintain a business or home environment network. Normally, we create strong password to protect unauthorized access, if we incidentally lost it, we have to reset Windows 2008 password. 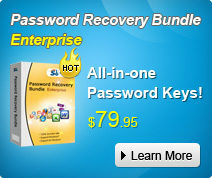 However, it is not as easy as resetting Windows XP/7/Vista password with some Windows built-in functions. Don’t fret; there is still a program which can easily reset Windows Server 2008 password. It is Windows Password Recovery Enterprise. This tool is designed to reset Windows local administrator and other user account password and reset domain administrator password with ease. No matter how long and how complex your password is, no matter how bad you are at computer or system, you are able to recover your password without any effort with the help of this utility. Section I: To burn a Windows Server 2008 password reset disk, you need the assistance of other computer which can log on to Windows. Step 1: Download Windows Password Recovery Enterprise, double click .exe file and follow the wizard to install it. And then launch it. Step 2: On the main interface of this program, choose “Reset Windows local account password”. Insert a blank CD to your CD-ROM or connect USB Drive Flash to USB port. Step 3: Tick “CD/DVD” or “USB” Flash Drive according to the portable device you insert in the previous step. Step 4: Click on “Burn” to start Windows 2008 password reset disk burning. Step 5: After the progress bar reaches 100% and an indicator pops up, click on “OK”. And remove your device from this computer. Section II: The directions below should be finished on the locked computer. Step 1: Insert the bootable device onto the locked computer, and boot it from CD or USB. Step 2: You will get the main interface of this program under Win PE environment. Choose the specific Windows installation. Step 3: Highlight one account you want to reset password and click “Reset”. Step 4: A confirmation box shows, and you need to click “Yes”, and then hit “OK” on the next popup. Step 5: Click “Reboot” to finish the reset. Section I: We need a Windows accessible computer to burn a password reset disk. Step 1: This step is the same as Step 1, Section I for resetting local user password. 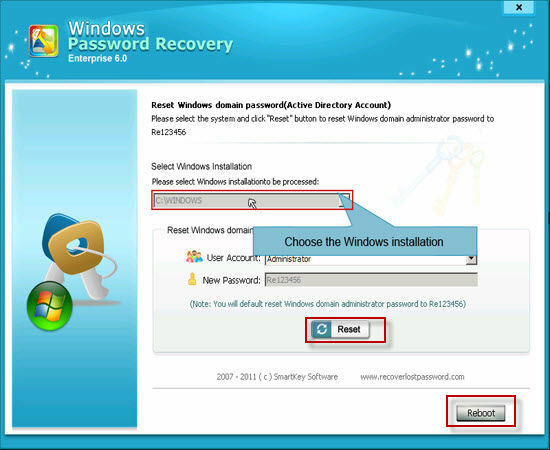 Step 2: Choose “Reset Windows Domain Administrator password” as your recovery mode. Insert a blank CD or connect USB Drive Flash onto your computer. Step 3: Follow the directions as Step 3, Step 4, Step 5, Section I for resetting local user password. Step 1: Follow the directions as Step 1, Step 2 Section II for resetting local user password. Step 2: Directly type your new domain account password and click on “Reset”. Step 3: The following steps is the same as Step 4 and Step 5, Section II for resetting local user password. 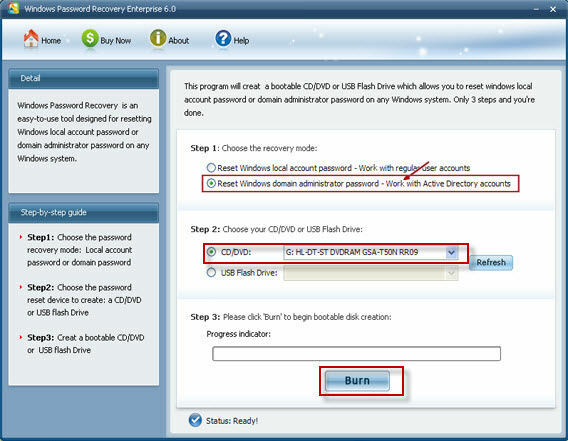 Tips: This utility also works fine Windows password recovery for Windows 7/Vista/XP/NT/2000/2003 server. Reset Windows 2003 password ?